This week, Future Majority has taken a closer look at all the accomplishments House Democrats have to show for their first 100 days in the majority. While standing firm against the presidential childishness that led to a destructive and pointless 35-day government shutdown, Democrats have set the tone for how they will govern -- and they won’t let up. Democrats listened to voters in the 2018 midterms and set about producing for them, passing sweeping legislation, providing Constitutionally-mandated oversight and holding Trump and the GOP accountable. After years of shameful congressional inaction from Republicans, Democrats passed meaningful gun safety legislation, including two background check bills that expand background checks to private gun sales and close the so-called “Charleston loophole” that allowed Dylann Roof to purchase a gun in 2015 and murder nine people at Mother Emanuel Church in Charleston, South Carolina even after a prior arrest and drug posession. H.R. 1112, the Charleston Loophole Bill, sponsored by Rep. Jim Clyburn (D-S.C.) closed the loophole in the current law through which some firearms are transferred by licensed gun dealers before required background checks have been completed. Americans families demanded change for their children, and Democrats are delivering. Democrats voted against Trump’s childish, unnecessary and fake national emergency at the Southern border. Trump’s attempts to divert $3.6 billion from military construction projects, which included much needed upgrades for housing for military families, was and is an affront to military families. This fight isn’t over, and Democrats have already moved aggressively to fight Trump’s dereliction of duty and wasteful obsession in court. And Democrats voted for the first time to take back congressional war powers and end the U.S.-engagement in the Saudi-backed war in Yemen. The vote was a massive rebuke to Trump and his corrupt buddies in Saudi Arabia. As we’ve said all week, Democrats are keeping the promises they made to voters, and they will continue to fight for America and the American people. The first 100 days were just a start. Democrats are determined to bring real relief to the American middle class while holding Trump and his cronies accountable by doing the kind of oversight the Constitution requires. 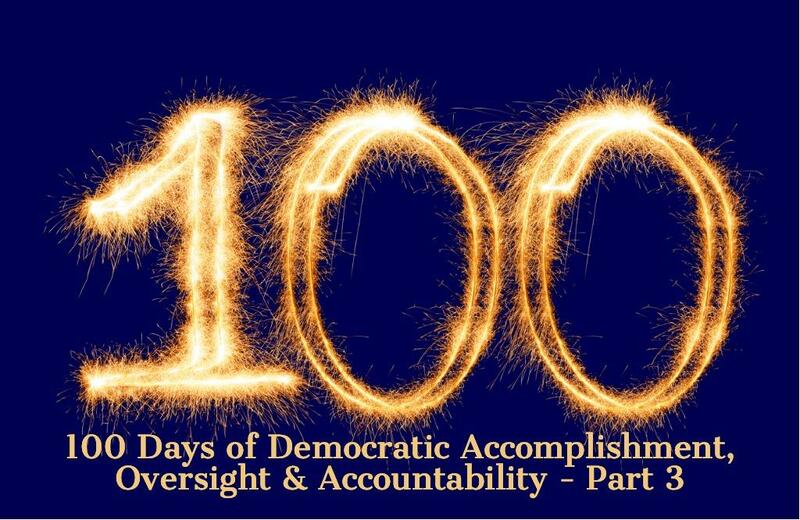 Let us know what you think about the Democrats first 100 days -- a period marked by a relentless push to make progress for the American people, provide oversight on a dangerous administration run amok and hold Trump and his chaotic and corrupt administration accountable. Stay tuned, as we will continue to share more key Democratic accomplishments.